2.2 Syrup of the fresh plant. How to do it? Scientific noun: Plantago major L.
Habitat: In cultivation lands by the side of the roads, in rich fields and farms. Their leaves must be collected in spring or summer. They must be kept in the shade inside clean airtight containers. 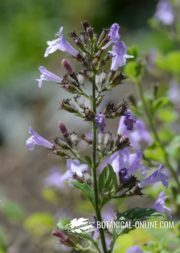 At the same time, The antibacterial properties of this plant can be profited to eliminate microorganisms produced by respiratory tract diseases. Taking into account its decongestive and expectorant properties to unswell the respiratory tracts and help to expel mucosities that can develop there. Syrup of the fresh plant. How to do it? Mash the plant, filter the liquid. Mix it with sugar in the same proportion, diluting it previously by putting the pot in hot water. Take three spoonfuls a day. Bactericide properties of this plant are spoilt by heating it, so it is better to prepare a cold infusion to treat bacterial infections. As emollient, an infusion of a teaspoon of dry leaves for a cup of water can be made. Take three cups a day. This infusion is suitable for irritable colon, colon inflammation (colitis), intestine inflammation (enterocolitis). A couple of spoonfuls a day of this syrup helps to diminish pain caused by a stomach ulcer. 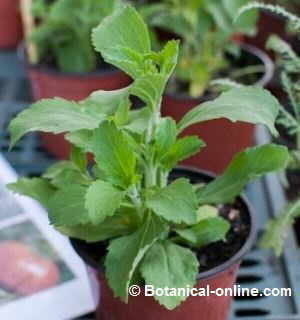 – Hemostatic: Plantain has been proved to be a good hemostatic plant, that’s to say it favors blood coagulation in wounds. This property can be very appropriate not only to treat wounds produced in the outer part of the body, resulting from a cut or a traumatism, but also to those internal ones which are produced when little veins or capillaries are broken. – Vulnerary: The fresh leaves of plantain are one of the best vulneraries. They help the body to heal wounds, cuts, scratches, etc and promote scar formation. This property is attributed so much to their content in tannins as well as alantolin. Tannins function as hemostatic and cicatrizant. It is a substance that stimulates epidermis cell growing and replaces those cells that were injured, so it produces their regeneration. This is the reason why this component is used by the cosmetics industry for the composition of skin creams. Leaving apart the complexity of those types of creams, a simple well-washed fresh leaf of this plant can be applied on a scar to stop bleeding. 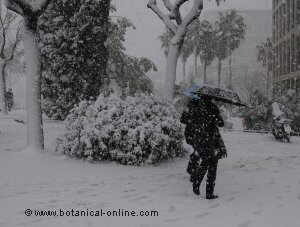 By doing this, it will help to cicatrize and prevent the risk of infection. – Burns or sunburns: By applying a plaster, made with some crushed fresh leaves, it will diminish pain and help the burn to regenerate. 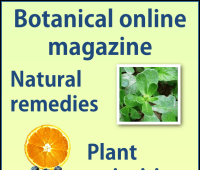 – Insect bites: The juice of the fresh plants aids to diminish swelling. It can be used for many insects, such as bees, wasps, mosquitoes, fleas, etc. It the same way this juice can be useful to alleviate the extreme itching produced by the sting of nettles. 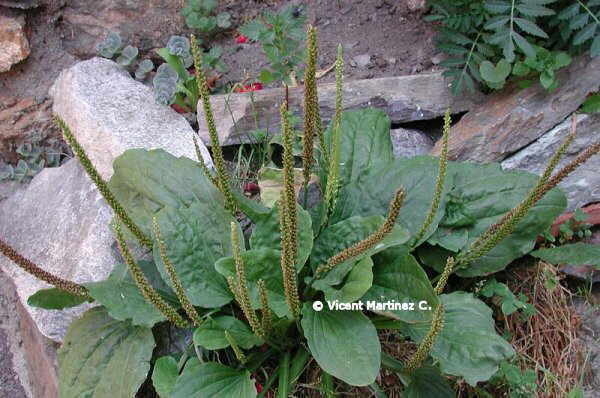 Greater plantain as edible plant: Young leaves of plantains (Plantago major, P. minor, P. lanceolata) are edible. They can be eaten in salads, together with another vegetables, or they can be cooked. 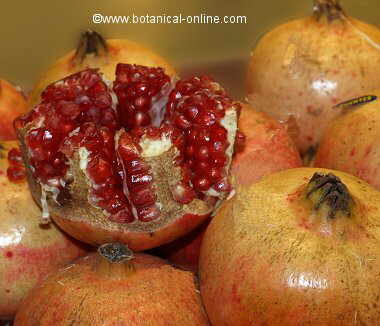 They are very rich in vitamin C – Till 19 mg each 100 g at the beginning of spring. 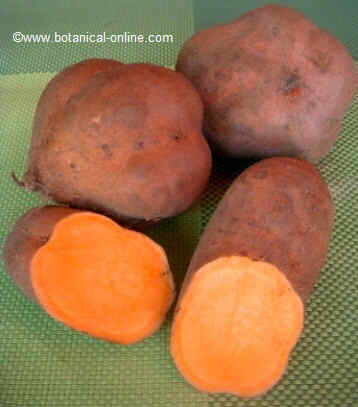 They also contain vitamin A and calcium. Anther possibility is to fry them. However, when they grow older, even though they are eatable, they become fibrous and present a very hard taste. So, it is better to eat them young. Plantains are often food for herbivores, being one the usual nourishment for rabbits or caterpillars. Many birds feed themselves with the seeds. No contraindications have been reported except some allergic reactions to some people. Narrowleaf plantain (Plantago lanceolata) It differs from greater plantain in its lanceolate leaves, that become progressively narrow at the base. It has also got longer filaments in the stamens. Its medicinal properties are similar. Hoary plantain (Plantago media) It shows elliptic leaves covered with silky hairs. The leaf stems is shorter and flatter. 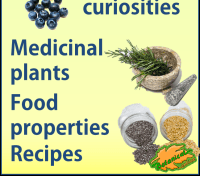 Medicinal properties are similar to the previous ones.